Restaurant Patrick Guilbaud is Ireland�s top restaurant, holder of two Michelin stars as well as virtually all the top national and international awards. 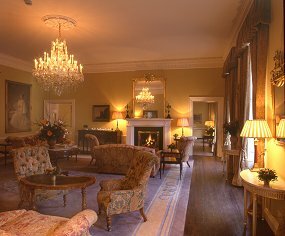 It is situated in an 18th century Georgian Townhouse adjoining the Merrion Hotel. It houses an impressive collection of Irish Art. This bright, elegant restaurant, run by Stephane Robin, serves modern classic cuisine using the best Irish produce in season. The restaurant has played host to many famous guests over the past 25 years. Chef Guillaume Lebrun�s signature dishes include the Lobster Ravioli, Roast Challans Duck for two, Assiette Gourmande au Chocolat. Everything is made on the premises from the wonderful selection of breads to the petit fours. The wine list is very impressive in both its depth and its range � do take time to peruse it.